Nick Denbow is a really interesting guy. He’s a Brit, supports Chealski Football Club and guides for permit, tarpon, bonefish and trigger fish in Mahahual Mexico. It all seems terribly implausible, but Nick is perfecting suited to Mahahual (minus his skin tone’s lack of innate cancer fighting properties). 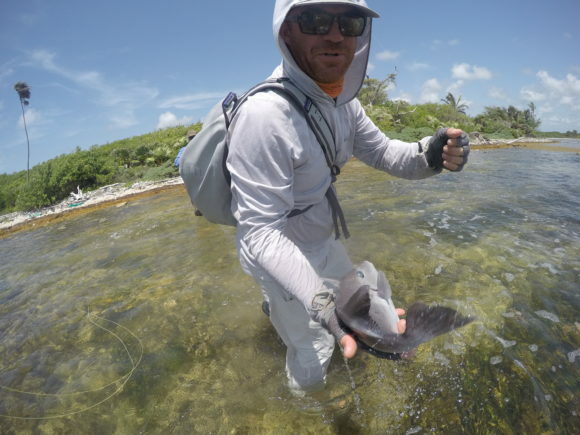 I got to fish with Nick for a couple of interesting days down around Mahahual. He showed himself to be extremely knowledgable, personable and thoughtful. We even stopped to help a stranded family from England with a flat tire. When you live in a place as remote as Mahahual, everyone has to look out for everyone. Nick contributed to the book Fly Fishing the Yucatan and if you are headed that way, you should pick it up. Nick answered a few questions about himself and his fishery. Enjoy. Nick, how did an Englishmen end up in Mahahual, Mexico? 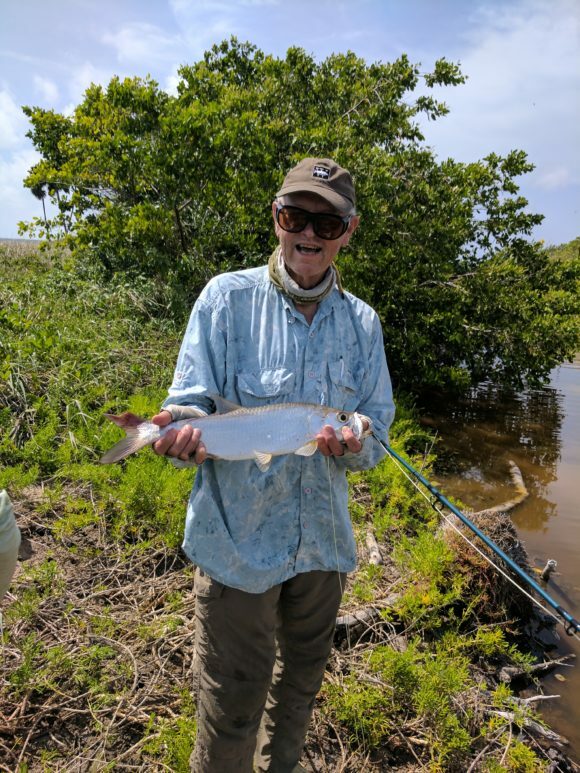 My first taste of Salt Water fly fishing was when I was sent (by my fishing store Sportfish Farlows of London) to Jardines de la Reina, Cuba in 1999. I think I knew from that trip on that i HAD to spend more time with a fly rod in the salt if I was to further my fly fishing career and quench a new personal thirst. The chance came after a spell as manager of Boss and Co Shotguns in 2001. The company was sold, I had some money in my pocket and was faced with going back to the fly shop. It was Feb 1st 2002 when I sold all i had, left my favorite Trout rod and a few clothes with my folks and jumped on a flight to Cancun. I didn’t go home for the next 5 years. I now call Mexico home. You have a great quote about permit. Share with the group. I get laughed at when I say it but to me it makes sense. People always say how hard Permit are to catch. I disagree. The ones you catch are some of the easiest fish you will ever catch. Its all the ones you didn’t catch that were hard. My point is simply that it is a numbers game. You need to get shots, lots of shots. The more fish you cast at you will eventually pull your fly across in front of a fish who will just swim up and eat it… theres nothing hard about that fish at all. I would also like to add some small print. The better at casting and presenting your fly you are, the more “easy” Permit you will find. One thing I managed when I was down there was my first trigger fish. I wasn’t expecting that. What is it about triggers that you enjoy? 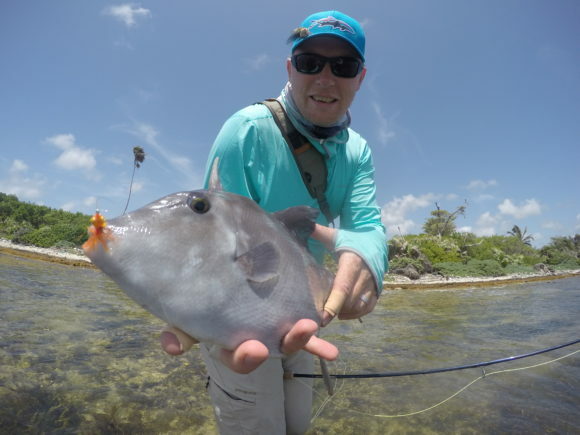 Trigger fish are rarely seen on the flats. Most people fishing here fish the flats. For these reasons they are largely unfished for. I am the only guide fishing 78 miles of coast here and Triggers are from top to bottom. They tail happily, are easy to see in the shallow clear water, they are fly friendly and can fight really well. Thats a great combination for fly fishermen. In the Pacific they are highly prized and targeted by fly fishermen, it seems strange to me that these fish are not getting more attention but they have helped me grow my business so I am actually glad nobody else is chasing them. Oops… how many people read this? What do you think the biggest misconception about your fishery? “Is it always this windy?”… thats my favorite misconception. Many people have come here once and go back with the understanding that its always really windy here! We have all weathers. An average wind speed here compared to that on a Trout pond or stream can be humbling and frustrating to an average caster. Firstly I encourage practicing casting into the wind before you get here. Once you are here and the wind picks up I advise anglers to look for areas where they can wade out on to one of the many shallow reefs, turn your back on the wind and cast across it. There are so many different habitat types here that if the waves are too big or the water to deep in one spot then you need to move to a different area instead of making it hard on yourself. It is not supposed to be an ordeal. Everyone seems to be here hoping for super flat and calm conditions however when this does happen (September and October between the storms) there is little flow and current on the reef and the water is often too warm and oxygen poor for the fish to come in and feed. In short, no waves generally equals no fish. Learn to deal with the cards you have been handed on that day and don’t waste time in an area where you cant cast or present a fly. We caught one sabalito that had a line through it as some fisherman had figured he’d take the tarpon home to eat. Is consumption of gamefish impacting the fishery? Currently Bonefish, Tarpon, Permit and Snook have no size limit, closed season or protection from the Mexican government. People here are allowed to harvest them. Its how they feed themselves and for some its how they make a living. This has been going on since there were people on this coastline. Hopefully soon this will be changed under the fisheries more protected under the new act that is passing through right now called “The Mexican Caribbean Reef Park”. This act will protect valuable sport fish species and restrict fishing activities for the whole coast from Isla Hotbox to Xcalak. Locally I have a problem with people leaving out gill nets unattended and spear gunning in the lagoons. Both of these activities are illegal. Its not so much for the fish but more as this is the last stronghold for Morelets Crocodile (Crocodylus moreletii) but the fish benefit from being in the same waters. This said I have not been checked in 15 years fishing the lagoons here by any authority. President Pena Nieto banned gill nets from the sea of Cortez 3 years ago. He desperately needs to do the same on this coast in my mind. You have tarpon filled lakes connected to the sea by cenotes. What is the oddest thing you’ve seen in one of those lakes? The oddest thing i ever saw i cant identify so Im going to have to assume it was an alien. At the risk of losing readers at this point I will move on to the oddest thing Ive seen that I could identify was a Bigmouth Sleeper (Gobiomorus dormitor) caught on a Gurgler. I had never seen one before and as it looked vaguely Catfish like I made the mistake of lipping it… I wont do that again as they have a zillion needle like teeth. You are a guide working in a place without many other guides. 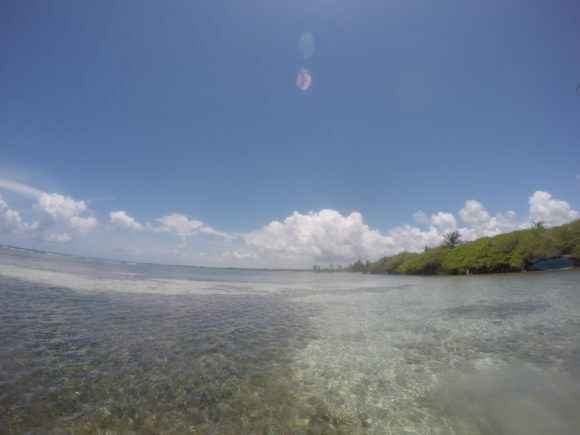 How have you seen the fishery develop over your time in Mahahual? Last two years we have had a drought (until TS Franklin arrived last night) and the lakes were the lowest and clearest I have ever seen them. This negatively affected catch results on Tarpon. This is a natural phenomenon and nothing I can do about it except harass the fish less, try to fight them harder and get them unhooked as quickly as possible. In general I think that I am finding more Permit on the beaches now than I was years ago but this I attribute to knowing them better not necessarily as there are more fish out there. Each year I see more and more fishermen on the coast. Most I know and are probably fishing with me a day or two during their stay. I always try to stay in touch with them almost daily to see where they have been and plan to go so that we can avoid fishing the same area or for fish that have already seen an angler that day. This way we get better catch results. come out bonefish… where are you? Is there a type of angler who should NOT come to Mahahual? You know, I have had anglers with zero balance, anglers who are hard of hearing or vision impaired. I even fished with a gentleman who was born with no legs. If I am prepared I will try to make anything happen. I encourage guests to let me know so its not a surprise when I find out game time that they cant wade on anything but flat sand. One negative aspect of being a guide here is that Ive had people follow my car down the beach road and then run out in front of me and my guests and cut me off on the flat. Those guys should stay at home! Best place to eat in town? Nohoch Kay for Seafood is hard to beat. Try the whole Hogfish. Thanks Nick. Hope to fish with you again at some point! This entry was posted on Wednesday, August 9th, 2017 at 7:57 am	and is filed under Locations. You can follow any comments to this entry through the RSS 2.0 feed. You can leave a comment, or trackback from your own site.